A regional daily which successfully campaigned for a £500m electrification scheme had been praised by Prime Minister David Cameron. Two years ago the Derby Telegraph launched its Electrify Our Line campaign to upgrade the Midland Main Line between the city and London. Last month the government announced the project would be included as part of a £1.6bn package of rail infrastructure improvements. Speaking this week, Mr Cameron described the paper’s initiative as a “superb example of a grassroots community campaign”. Mr Cameron said the electrification of the Midland Main Line would be another boost to Derby’s rail industry, following the news in February that city train-maker Bombardier had been awarded the £1bn Crossrail contract. He said: “The Electrify Our Line initiative was a superb example of a grassroots community campaign, as I learned during my visit to the Derby Telegraph. “This £1.6 billion package from Network Rail will see enormous opportunities created for Derby as part of the government’s long term economic plan. It was revealed on 31 March hat the stretch of line between Bedford and Sheffield – which passes through Derby – would be included in spending plans for 2014 to 2019 after previously missing out on the investment. It will reduce journey times between Derby and London by at least nine minutes. Electric trains are due to begin operating via Derby by the end of 2019. 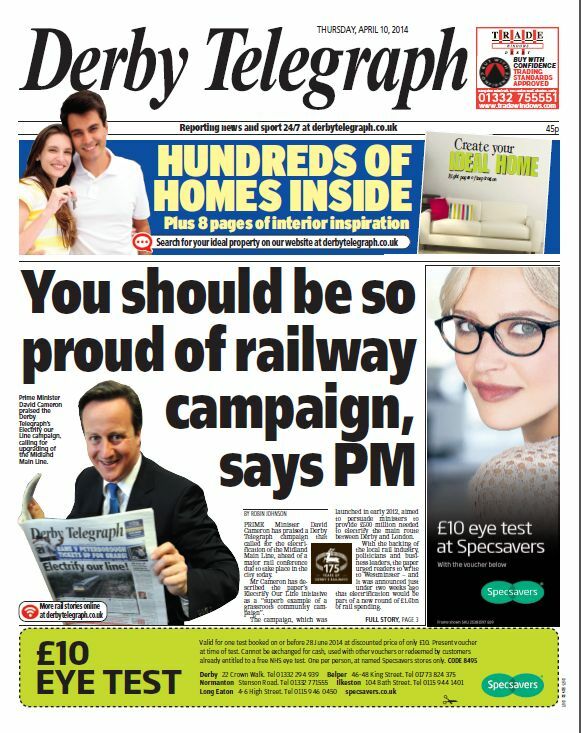 I am a great fan of the Derby Telegraph and believe it to be one of the better regional dailies. Nevertheless, I have to share the howler perpetrated in an online heading yesterday. It was reported that temperatures in the area were set to ‘saw’. I suppose electronic journalism is supposed to be at the cutting edge. Excellent campaign by the Derby Telegraph for local readers but David Cameron makes me laugh. Why is this a “superb example of a grassroots community campaign” involving rail, when the far more widespread local newspaper campaigns AGAINST the madness of HS2 rail in its present form are dismissed out of hand ?